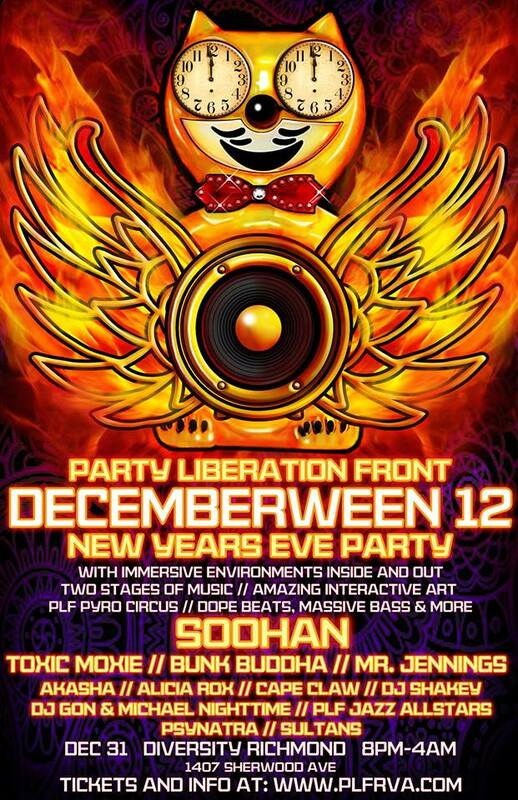 It’s time for another Decemberween and for their twelfth year, Party Liberation Foundation is bringing all the crazy antics, fire, and pyro effects, dancing, music, art and more that you love to send off 2017 with a bang. 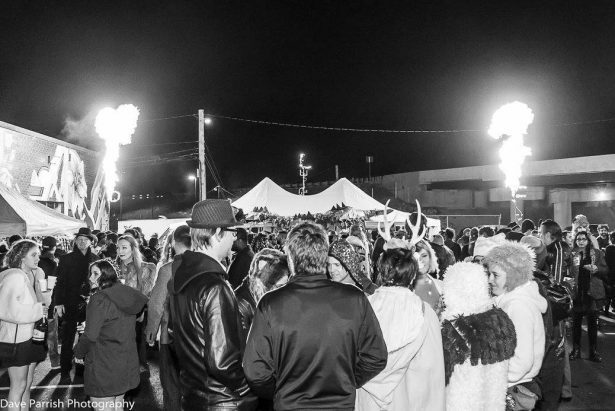 RVA Mag President John Reinhold recently sat down with the co-founder of PLF Conway Jennings, who will also be playing a set at the event, to get the rundown on this year’s festivities. 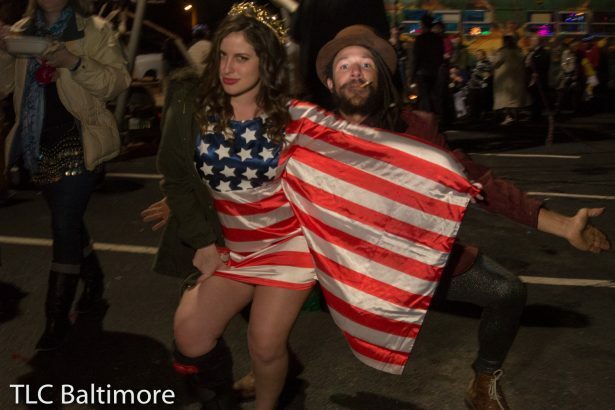 Reinhold: What makes this NYE event different than others around Richmond? Jennings: Well, I think the main difference is that we create a pretty immersive environment. There’s a lot more going on than just some bands or DJs and a bar. 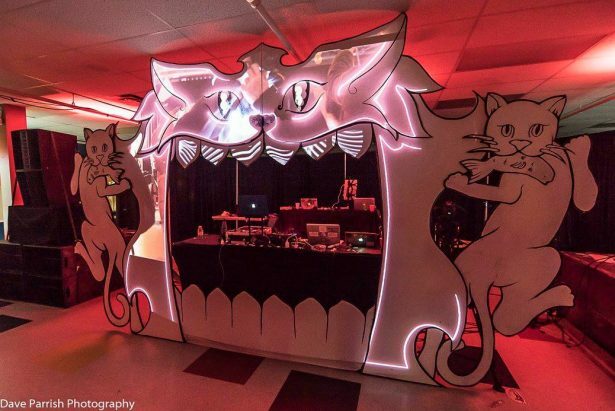 There are multiple rooms inside, plus a large outside area, with many art installations placed all over the event. Musically we will feature a variety of DJs and a few bands, offering cutting edge underground dance music as well as some great live music. Oh yeah, we also go late! Reinhold: The event is hosted by Diversity Richmond, what do you like about this venue? Jennings: Well, for starters, we feel great about their mission. It’s super important for us to create a safe space for people from all walks of life (including race, gender, sexual orientation, etc.) to be themselves at our events. It’s great to work with Diversity knowing that we share this goal. The venue itself is also perfect for us. Because it’s largely a blank canvas, we are able to bring in art, decorations, projectors, lights, etc. to transform the space differently each time. Fire spinning and fire art are both very important for our community, and use of the parking lot allows us to safely include this element. Ivan Trittipoe and the crew at Diversity are also just super friendly and great to work with. Reinhold: What’s new for this year? Jennings: Well, this is the 12th Decemberween, but the third year at Diversity Richmond, and also the third year above ground. It’s been more of a smaller private party in the past. This year we are completely flipping the layout inside, which is exciting. We’re also adding a third bar in our new speakeasy /cabaret lounge, which will help cut down on waiting in line. We’ve also increased funding for art grants, so there will be even more awesome art both inside and out. Reinhold: Tell me about your headliners and music plans for guests this year? Jennings: We’re really excited to have Soohan as our headliner. He’s been making waves at all the West Coast festivals for the past couple summers, so we’re stoked to have his unique blend of global bass and hip hop at Decemberween. We’re also super stoked to have Richmond dance punk favorites Toxic Moxie in the lineup. 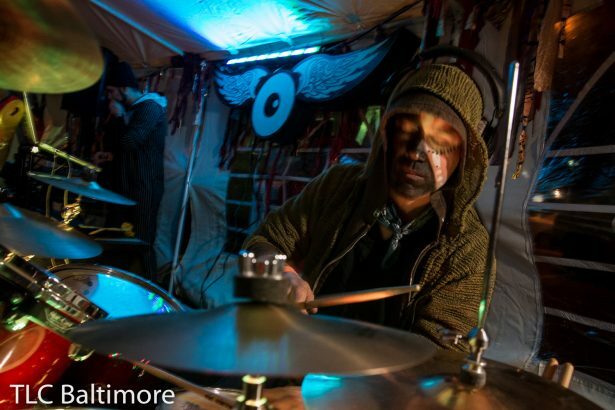 Bunk Buddha will be joining us from Baltimore, as well as DJ Shakey from New York City. We have a lot of PLF favorites rounding out the rest of the lineup. The music is really gonna be amazing this year. Reinhold: Sounds like you have more live music this year. Things like the jazz speakeasy lounge, what’s the plan for that room? Jennings: Yup! We are turning the smaller room inside into a speakeasy/cabaret lounge this year. We will have a jazz band playing throughout the night, with a variety of dance and burlesque performances in between. As I mentioned before, there will be a bar in there, as well as tables and couches, so you can take a load off and enjoy the show with a nice cocktail. 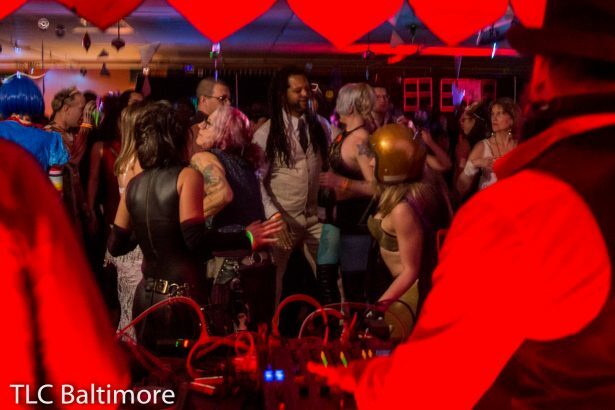 And while we generally lean pretty heavily on electronic music, we’re stoked to have Toxic Moxie’s blend of live dance music to spice things up a bit. Reinhold: What kind of large-scale art and immersive environments are planned? Jennings: We’re super excited to have Davina the Dragon for her first PLF event in years. Outside we will have a whole bunch of fire sculptures and flame effects, but there will also be all kinds of other fun stuff. Ziggy Sawdust will be carving wooden portraits of partygoers with a chainsaw, live (yes, really!). Man Camp! crew will be constructing a roving Trojan Mop Bucket because …well, why not? Inside, we will have Illumious Plumes, a giant peacock with an amazing paint job, by Emily Wimbis, Alexa Eliana, and Molly Chopin. Ian Hess and crew will construct a wondrous 8-foot tall glowing pyramid, complete with mysterious glowing obelisks. And this is just less than half of the art grants! There will be all kinds of awesome stuff this year. Reinhold: Tell me more about the fire-breathing dragon? 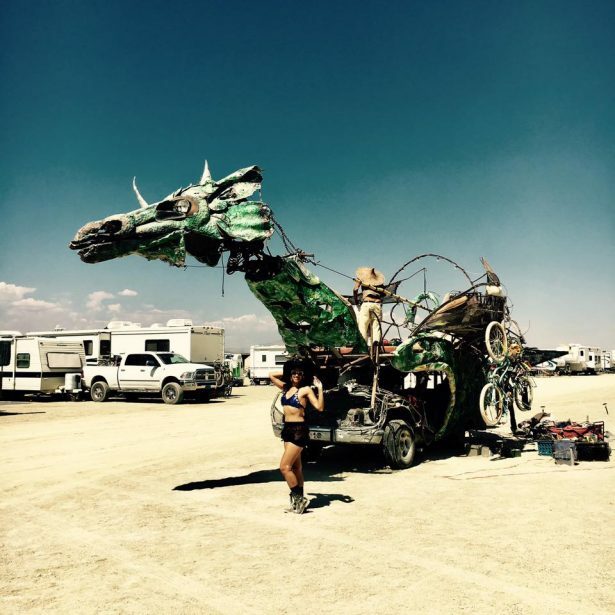 Jennings: Davina is a 30-foot long, 10- foot tall fire-breathing dragon art car. She was built in 2010 by Charlottesville artist Christian Breeden, who also built Josephine the Colossal SkeletalMarionette, an integral part of our past two Decemberweens. 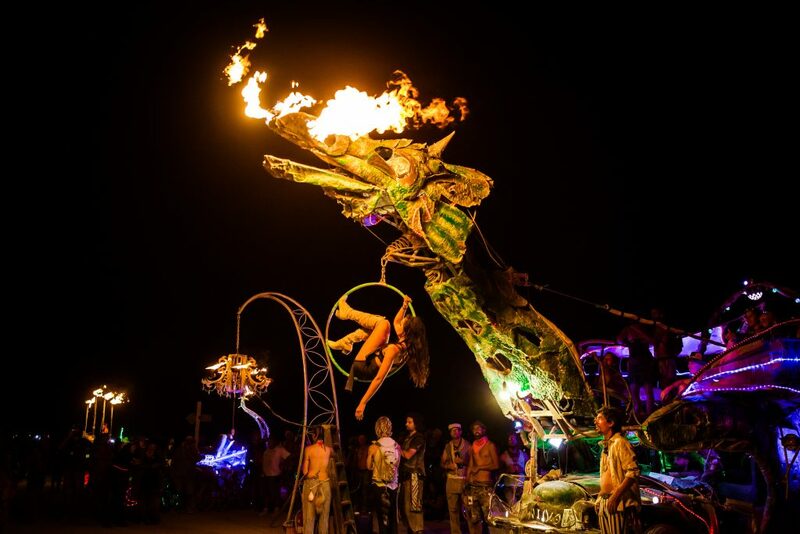 Davina has been prowling the playa at Burning Man for the past several years, offering rides to wayward burners and dazzling everyone with her flames. But she has made a triumphant return home to Virginia! This will be her first PLF event in many years, and we couldn’t be more excited to have her back. While there won’t be room for her to move around too much at Decemberween, she will definitely be shooting plenty of fire. Reinhold: So we know you all love fire, are there going to be fire performers or special performances? 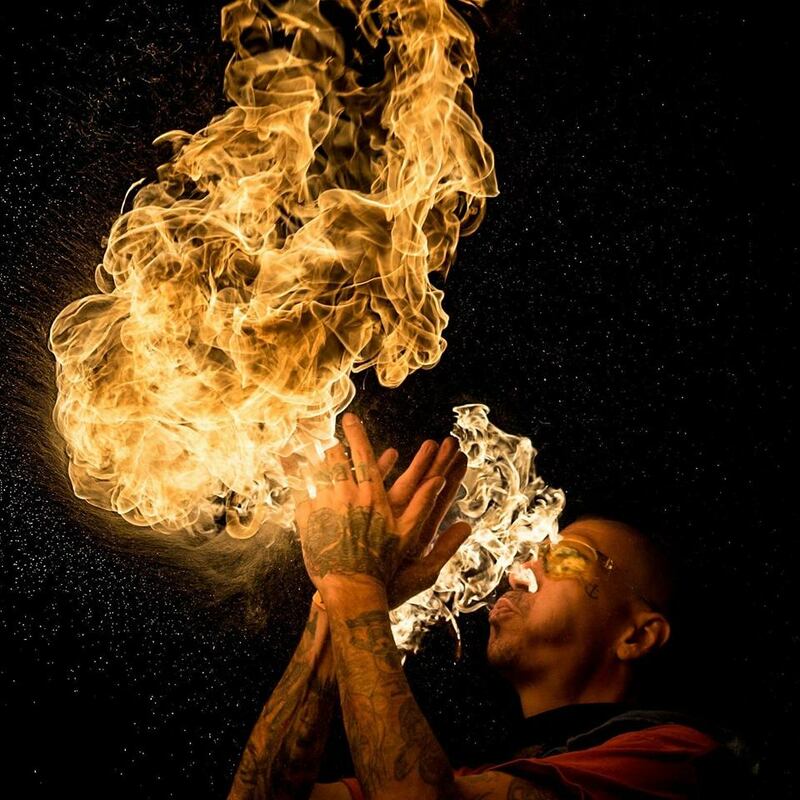 Jennings: In addition to Davina, we will have a wide variety of flame effects and sculptures, as well as live fire performance throughout the night. Expect a lot of fire at midnight, from humans and dragons alike. Reinhold: The entire event s a benefit for Party Liberation Foundation correct? Jennings: Sure is! The Party Liberation Front collective has been around since 2006, but we decided to start a non-profit last year. 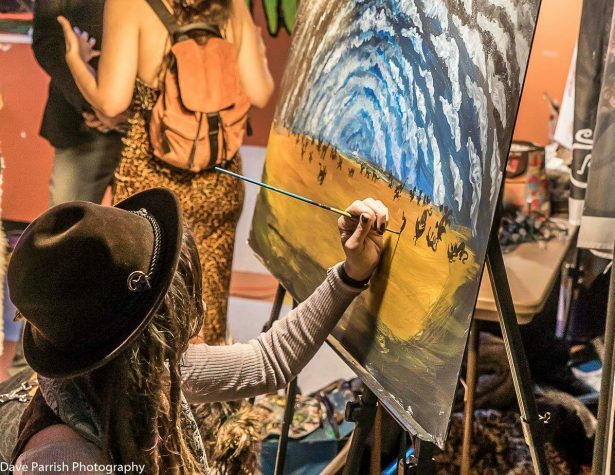 Our goal is to nurture the arts and the creative community in the Richmond region. Over the past year, we have awarded several thousand dollars of art grants both for our events and for local art openings. We have also launched a series of free workshops on performance art, dance, and more. We’re very new to this, but we are excited to see what the future holds. Reinhold: How can people purchase tickets? Jennings: Diversity has allowed us to increase our ticket cap to 700 this year (up from 650), but we do expect it to sell out, as it has the past two years. Grab your tickets here.